We Offer Financing - Click Here! 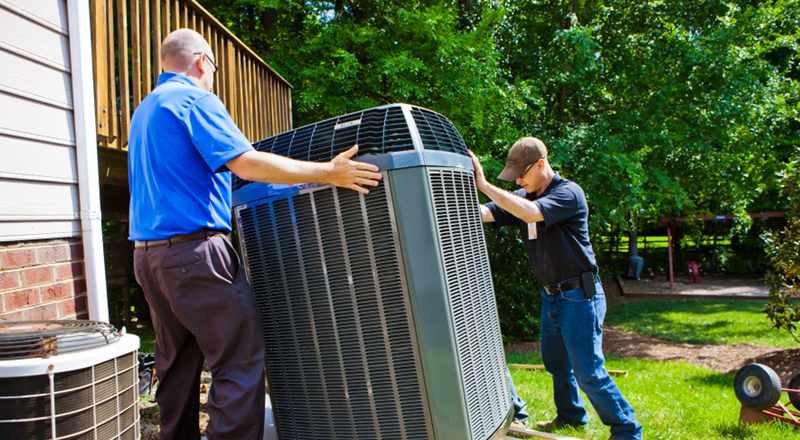 We proudly offer an expert air conditioning and consultation, and a detailed proposal specific to your needs at no cost to you as part of our initial assessment for air conditioning installation or heat pump replacement. Several industry studies reveal that well over 59 percent of new central air conditioning systems are not installed properly, and over 89 percent of new air conditioning system installation mistakes result in sub-par energy performance and premature failures. You can trust our highly trained professionals at Howard Services Air Conditioning to properly assess your air conditioning or heat pump system and if it needs to be replaced to install your new air conditioning system properly. We will never use high-pressure tactics to try to sell you an air conditioning system you don’t need. We will be a true partner by helping discover the heat pump or air conditioning system that is best for you and your family. We have a motto, and its more than that “professionals you can trust” — it’s our promise that you will receive professionalism in all your dealings with Howard Services Air Conditioning. Our expertise is heating and air conditioning installation and repair, but our integrity is what makes us stand out. Howard Services Air Conditioning is the air conditioning replacement specialist you can trust in Jacksonville since 1969. When you’re looking for the highest quality cooling systems and expert air conditioning installation, look no further than Howard Services Air Conditioning. As an Amana Factory Authorized Dealer, our team upholds a reputation of excellence in every service we provide and with each product we install. Our technicians are certified, background-checked, drug screened, and insured. We are a local Jacksonville business who prides ourselves in doing what is right for our customers. Careful, accurate, and knowledgeable workmanship combined with leading HVAC systems guarantees lasting and satisfying heating and cooling for years to come. For the sake of comfort and efficiency, proper sizing of the air conditioning system is extremely important. The term “size” refers to the unit’s ability to produce cooled air. Generally, the larger the capacity, the more expensive the equipment — but bigger is not always better. An oversized system will cycle on and off too frequently, never reaching ideal efficiency or dehumidification levels. The constant cycling also puts added stress on components and may lead to more frequent system repairs and shortened service life. Too small of a system will fail to keep up with load requirements, especially on hot days. You can count on the experts from Howard Services Air Conditioning to properly design your new system for maximum efficiency, durability, and performance.